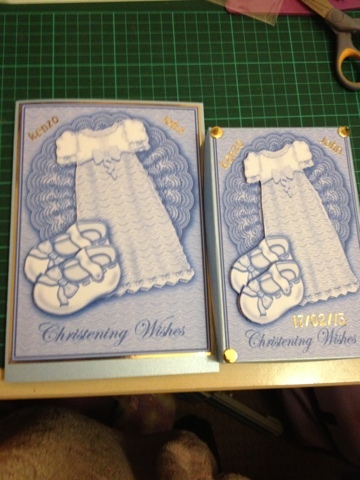 Sam's handmade cards: My godson to be forth coming christening. My godson to be is being christened this Sunday (17th) and his big sister wanted me to make him a christening box as she had brought her brother a cutlery set. So I set to work I purchased the sheet from craftsuprint it was pink so instead of purchasing another sheet to be in blue I brought it into my craft studio elite program and changed it to blue. So instead of just making the box I made a card for his christening. Such a beautiful box and matching card - love that image. Gorgeous, and a wonderful keepsake. Gorgeous and very cute card and I love the matching box too hun.